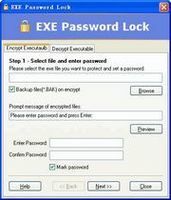 Free fast AES 128-bit disk encryption program. Private Disk Light allows you to create a secure space for all your work, exchange encrypted data with others, and feel sure that your information is safe from external and internal manipulation. Private Disk Light creates one or more secure virtual disks on your hard drive. Information stored in this secure area is automatically encrypted and may only be decrypted by entering the password. Without the password, the information from a secure disk cannot be accessed and decrypted. Private Disk Light employs an AES standard encryption algorithm. This technology ensures a high level of encryption, which does not hinder the computer’ s performance in any way. Important note: Dekart Private Disk Light contains No spyware, No adware, No viruses and it's freeware. Private Disk Light is very easy to use and takes only a few minutes to install. Data encryption is an effortless process, requiring only the copying of files into the designated secure drive. Private Disk Light keeps information safe and secure, but currently its development has been stopped. The product offering better functionality than Dekart Private Disk Light, is Dekart Private Disk, a highly configurable advanced disk enryption software, offering a host of important features and options. Try Private Disk Light, it's yours to use for free. And if you want a more full-featured product, look into Private Disk.